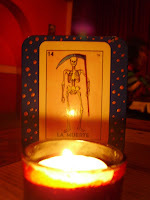 Mi Corazon is coming up for its second birthday, having opened at New Years 2006. Its been pleasing to see it maintain and grow its clientele during that time. A lot of thought and effort went into refitting the site (which used to be a cafe), as noted when we visited just after it opened. It's a big space, and outside of the Little Spain belt of Fitzroy it's not a model that features regularly in Melbourne's suburbs, whether inner or outer, so it's good to see what they have on offer being embraced. And what do they offer? A lot of tequila; a succinct range of cocktails (mojito - $12); a range of South American beers from $7.50; a thoughtful winelist featuring local producers; a range of seating from window stools and U-shaped couches at the front, to restaurant tables and a beer garden at the back; and a short food menu that promises familiar South American dishes, done authentically. One of those dishes is mole (pronounced mo-lay, as in the end of guacamole), a dish spoken of in reverential terms by those who have sampled the real deal, and by which people are usually referring to mole poblano, a savoury sauce famous for featuring chocolate as an ingredient. 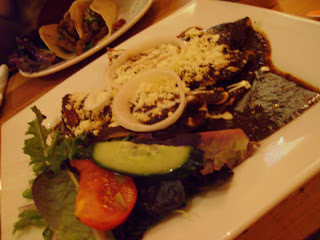 (Mole can refer to a range of sauces or dishes in Mexican cuisine.) Mi Corazon's version features ground nuts and radish, with dark chocolate melted in at the end. It arrives as a dark mass, lathered over chicken and topped with drizzles of sour cream, sprinkles of cheese and rings of sliced onion. Its reputation is such that one might expect something dynamic and taste-bud redefining; however, its renown owes more to subtley than sensation. The nutty flavour is a natural match with the chicken, and the radish adds a gentler piquancy than onion would. The chocolate kicks in a hint of bitterness and smooths the texture. Perhaps all three elements were slightly too far on the subtle side, and the chicken, to me, seemed a little dry, but I often find that with Mexican food, so it may be due to the cooking style. Tacos campechanos - with beef and chorizo - deliver more latino sizzle, particularly from a super-hot side dish of dressing. The lean meat was moist and, while suitably spiced, wasn't fiery. Three soft tacos nestled one another and held their own against the dripping juices - Old El Paso could learn something from their construction! 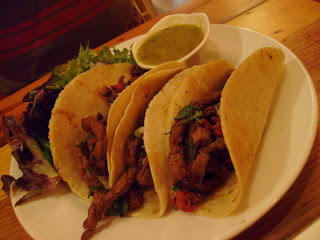 Tacos are always a revelation when they don't arrive slathered with sour cream and dripping with oil. 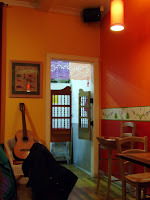 It's not super-cheap food - the mole is $20 and the tacos a little less - but it's the worthwhile price of authenticity. Staff are welcoming and the whole venue has a local feel: there's always someone at the bar who has worn their own groove on the counter. 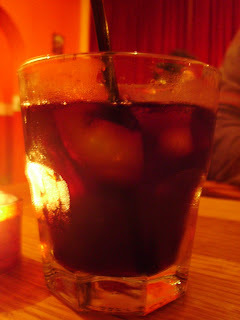 Mi Corazon have a fine sangria on offer as well, available by glass or jug. It's a deep, deep garnet red in colour and not too sweet.